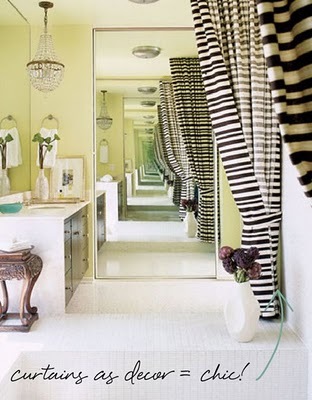 Fabric can really jazz up a room….or create a calming effect on a room. I am beginning to love curtains. 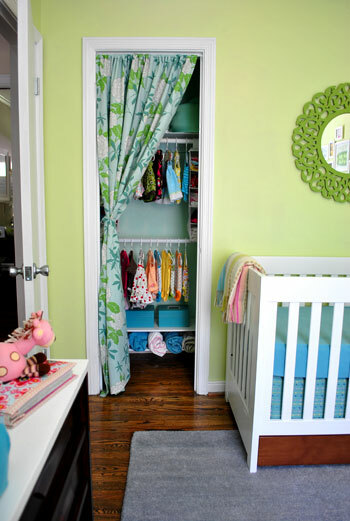 They are a great alternative to a door in a nursery closet. And when they are attached a ceiling, they can make a great backdrop on a wide wall. (No window required!) 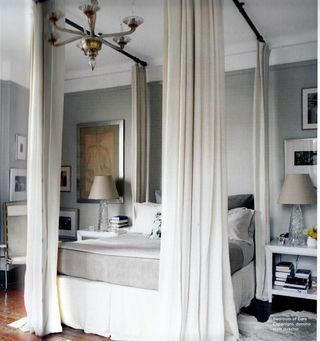 Of course, the sophisticated drama of fabric around a canopy is a personal favorite of mine. I have lunch with some girlfriends this afternoon, and lots of work to do this evening! Cheers to a happy summer weekend, friends! 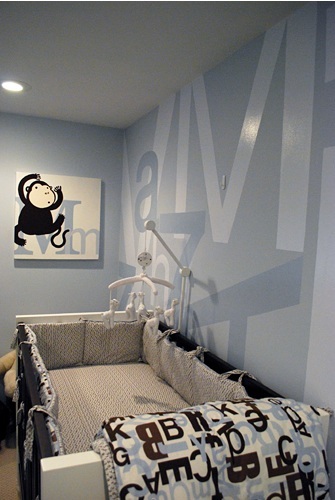 Photos are courtesy of Young House Love (nursery) and Pink Wallpaper. 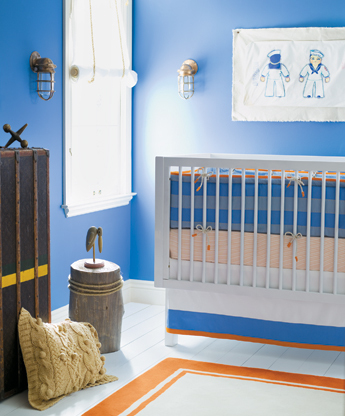 We spotted these cute baby boy nurseries at DecorPad! They are calm, cool and cozy! 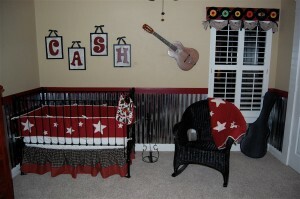 We found this rock n’ roll themed vintage nursery design at Design Dazzle! 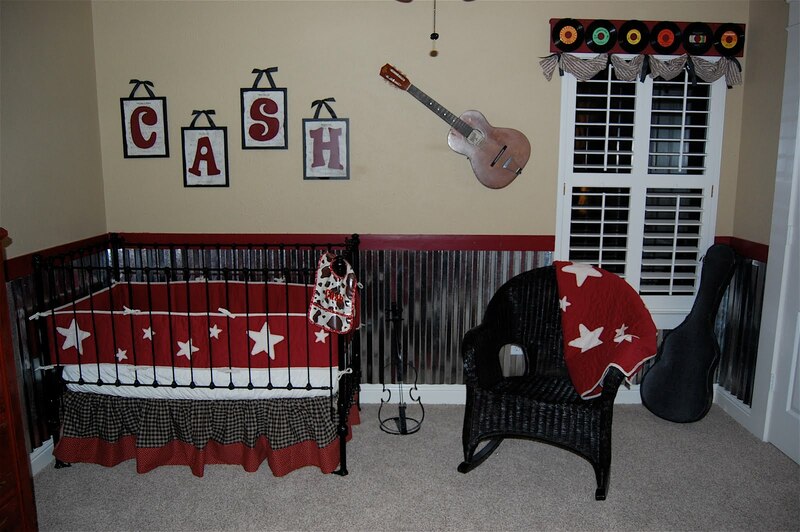 The baby’s name is even Cash…so this theme goes all the way. 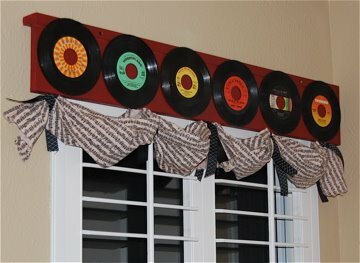 We love the record valance and the distressed wooden dresser. 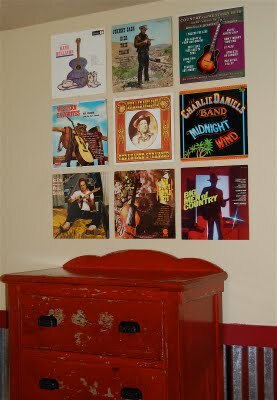 And all of the large album covers were found at estate sales. The creativity here is fantastic! We love it when Posh Tots releases new nursery ensembles! This vintage hanky look is fresh and fun. The bedding begins at $690. 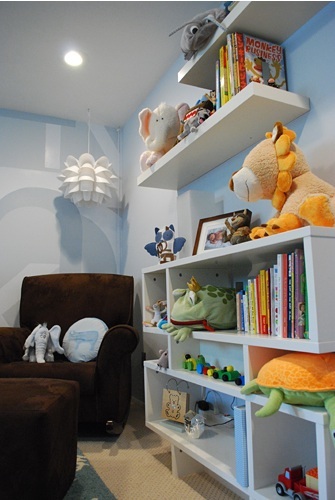 Project Nursery has some stylish Dwell nursery designs! Love it! We mentioned our love for Tori and Dean’s decorating style in the past; we have to admit we are big fans of Home Sweet Hollywood on TLC. Tori’s Hollywood Glam vibe is very appealing. 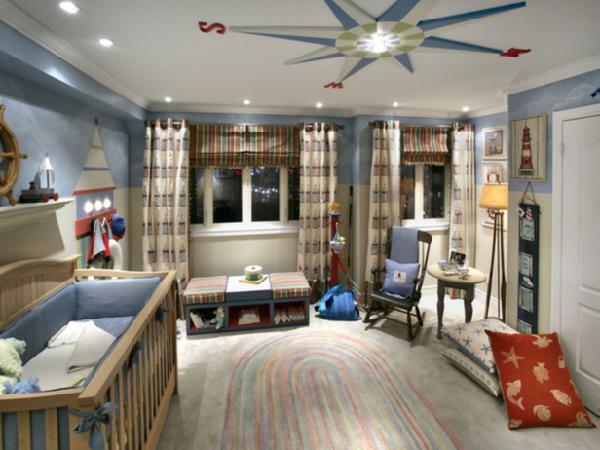 And we loved their daughter Stella’s room when it was featured on the show last season. 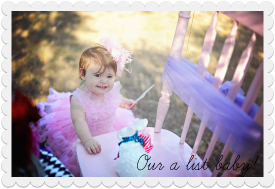 Today, we learned the furnishings are from one of our favorite baby stores, Posh Tots! 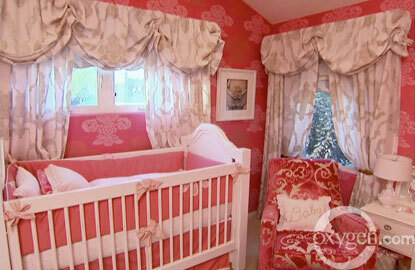 We recall that Tori wanted a chic look for baby Stella, and Dean insisted on a pink room for his first daughter. Below are some of the items that made this luxe room a showstopper. 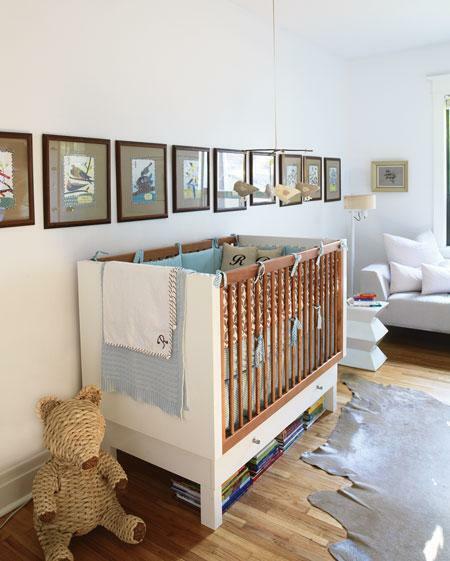 Domino Magazine featured some glamorous nurseries this month.This jewel-box space was created by Michelle Rubel, an events manager for the magazine. 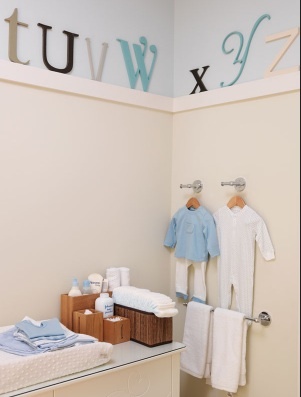 The theme for her son’s room is uptown prepster, and the nursery was actually converted from a walk-in closet! 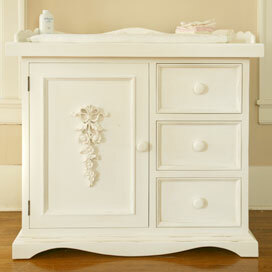 A Murphy bed-style changing table was painted to match the walls, so it essentially disappears when it is not in use. This is a great example of dramatic style in a small space. 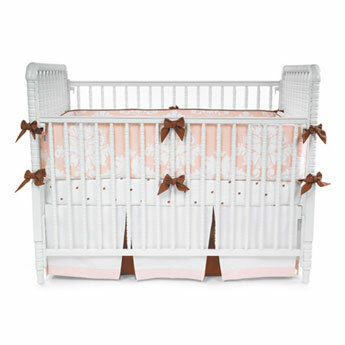 I have a serious infatuation with canopy cribs. This does not, however, translate into adult beds. Rather, I equate a baby canopy crib with an oppulance we can afford our little angels. We all have hopes and dreams for the newborns in our lives. 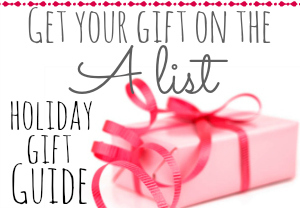 Certainly, we all know that “giving” a child the moon is not in his or her best interest. 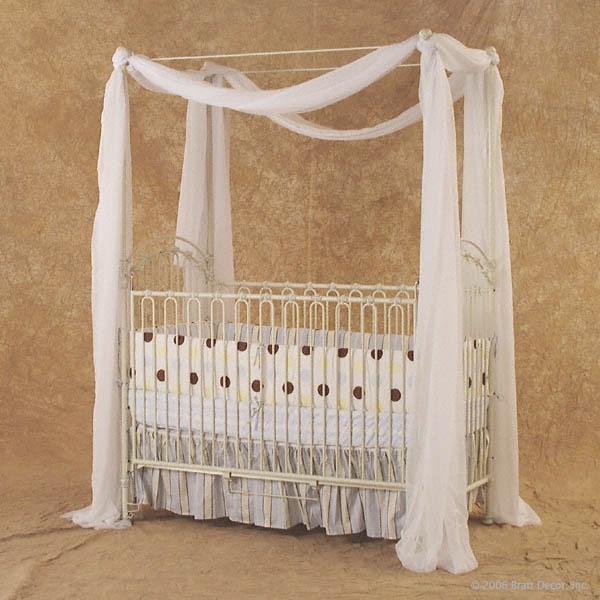 But for me, a white canopy crib is paying tribute to baby’s innocence and purity. Life gets hard soon enough. 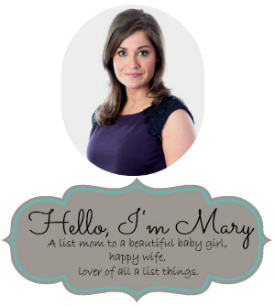 Babyhood is time to pamper infants….and indulge in some of our favorite luxury buys, as well! One of my favorites is from Restoration Hardware baby & child, below. 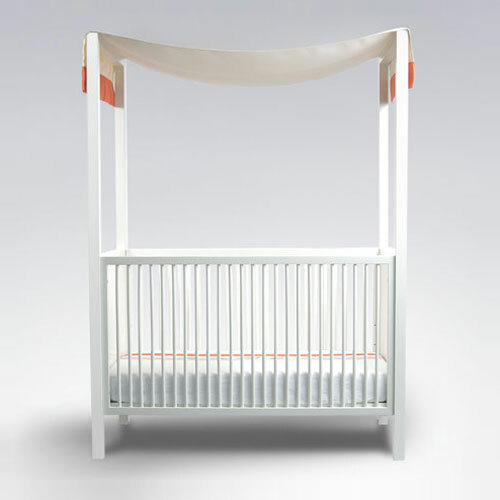 The white sutton canopy crib is $999. Bratt Decor also has an amazing venetian white wrought iron crib for $966 that would look excellent in a Hollywood-glamour type nursery. (The company offers several additional options for finishes, including gold.) You can make this look modern with bold bedding—or keep it traditional with pastels and a ruffled skirt. I could see this being a family heirloom crib, and Bratt Decor has an excellent reputation for quality. You may recall, Jennifer Lopez and Marc Anthony also chose Bratt Decor cribs for their twins.